Therioaphis trifolii apterae vary in colour from shiny yellow to greenish white, with rows of pigmented raised spots. The antennal terminal process is approximately equal in length to the base of antennal segment VI. Abdominal tergites I-V each have 7-10 hairs (cf. Therioaphis riehmi in which abdominal tergites I-V each have only 4 hairs, and Therioaphis luteola in which abdominal tergites I-V very rarely have more than 6 hairs each). Tergite VIII has 3-6 hairs. The hairs arise from pigmented bases and are mostly long and capitate. The dusky siphunculi are stump-shaped, flangeless, and very short. 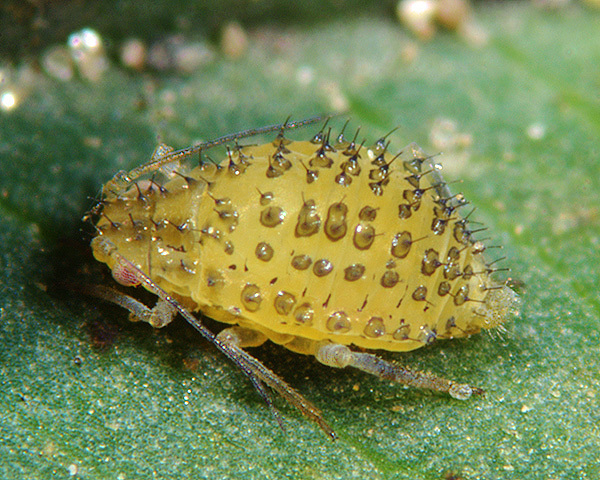 The cauda of Therioaphis trifolii is rather large and has a constriction and a knob-like apex. 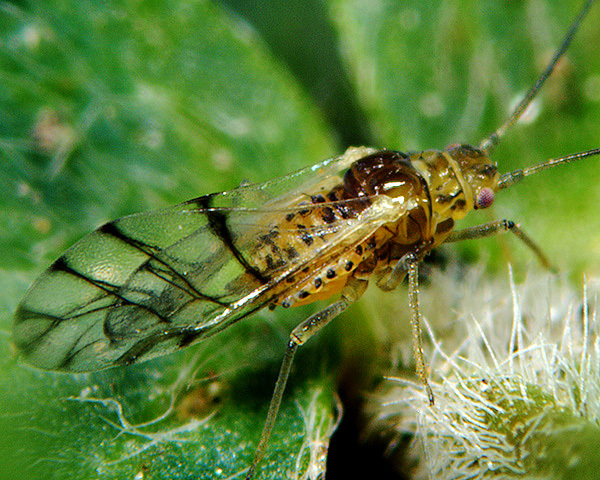 The alate Therioaphis trifolii is similar in appearance to the aptera except that the dorsal body hairs are shorter and less strongly capitate. The ovipara (see first picture above) is similar to the viviparous aptera, but the posterior extremity is produced into an ovipositor-like extension, and the hind tibiae are somewhat swollen. The male (see second picture above) has a similar pattern of sclerotization to the alate vivipara, but has secondary rhinaria on antennal segments III-V inclusive. The micrographs below show an apterous ovipara and alate male Therioaphis trifolii, in alcohol. 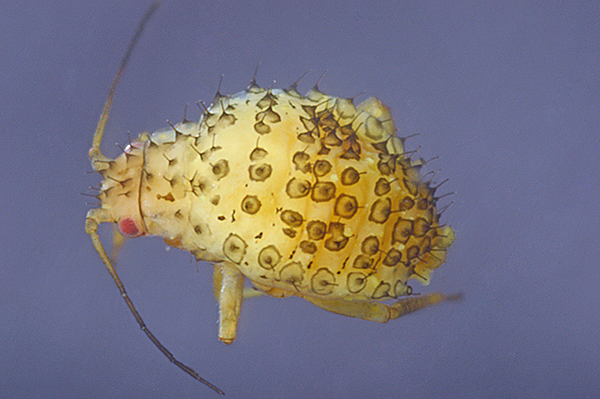 eastern USA in the 1880s, a biotype (the yellow clover aphid) feeding mainly on red clover (Trifolium pratense), now found over much of North America. south-western USA in the 1950s, a biotype (the spotted alfalfa aphid) feeding mainly on alfalfa (Medicago sativa), now found throughout the USA and Mexico, and introduced to Australia and New Zealand. 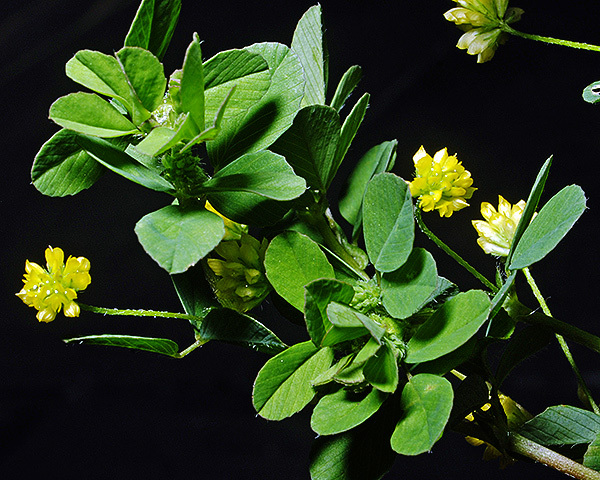 South Africa in the 1980s, a biotype feeding on Medicago and Trifolium. Therioaphis trifolii ssp. ventromaculata feeds on milkvetch (Astrolagus onobrychus) in central Europe. Therioaphis trifolii ssp. albae feeds on white melilot (Melilotus albus) in Ukraine. Therioaphis trifolii feeds on various members of the pea family (Fabaceae) especially clovers (Trifolium), medicks (Medicago) or trefoils (Lotus). It does not host alternate, remaining on the same host all year. 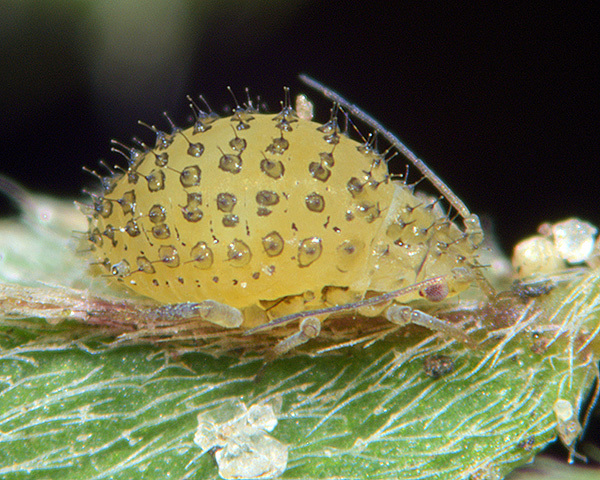 In temperate countries sexual forms develop in autumn, and the aphid overwinters in the egg stage. In warmer areas the aphid is anholocyclic. 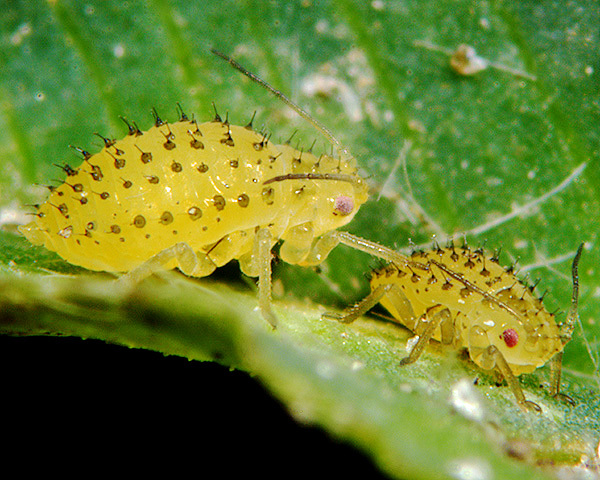 Stroyan describes the spotted alfalfa aphid as being a rare species in England, being only known from Kent, Berkshire, Essex, and Bedfordshire. To these counties we can now add East Sussex following our discovery of the species feeding on black medick (Medicago lupulina). We were looking at the aphids feeding on plants growing in the gravel ridge along the centre of a rough farm track in October 2018 following the discovery of another rarity, Aspidaphis adjuvans feeding on knotweed (Polygonum aviculare). Black medic was growing with the knotweed, and we found a small colony of Therioaphis trifolii on one of the black medic plants. There were a few immature aphids (see picture above), but since it was late October, we were not surprised to find that most of the colony were sexual forms. There were several apterous oviparae present (see picture above) and a single alate male (see picture below). Despite a careful search of other plants in the same habitat, no other Therioaphis colonies were found. Of those aphid species, Baker (2015) lists 9 as occurring in Britain: Acyrthosiphon pisum, Aphis coronillae arenaria, Aphis craccivora, Aphis medicaginis, Megoura viciae, Myzus ornatus, Myzus persicae, Pemphigus populi, and Therioaphis trifolii. Blackman & Eastop list 21 species of aphid as feeding on red clover (Trifolium pratense) worldwide, and provide formal identification keys. Of those aphid species, Baker (2015) lists 18 as occurring in Britain: Acyrthosiphon loti, Acyrthosiphon pisum, Aphis coronillae coronillae, Aphis craccivora, Aphis fabae, Aphis gossypii, Aulacorthum solani, Brachycaudus helichrysi, Macrosiphum euphorbiae, Megoura viciae, Myzus ornatus, Myzus persicae, Nearctaphis bakeri, Pemphigus ? populi, Smynthurodes betae, Therioaphis riehmi, Therioaphis luteola, and Therioaphis trifolii. 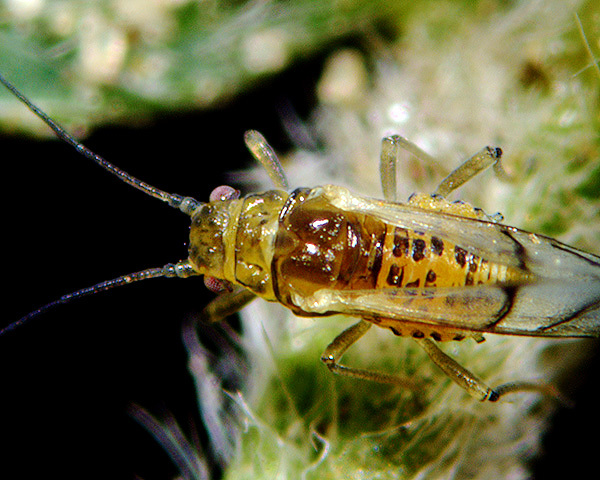 The spotted alfalfa aphid injects a toxic salivary secretion into the plants, which causes yellowing at the feeding site and along the veins of the leaf. Therioaphis trifolii are initially found on the undersides of the lower leaves, but move up the plant as these leaves are killed. Uncontrolled populations on susceptible plants can reduce yield of established stands by 50% and can destroy new stands. The honeydew and sooty moulds reduce hay quality and make harvesting difficult. Resistant varieties of alfalfa have been developed, although some strains of Therioaphis trifolii have overcome the resistance of past resistant varieties. Chemical control may be possible with some of the newest insecticides, but it has developed resistance to most organophosphates. Biological control with introduced natural enemies has been highly successful in some countries. 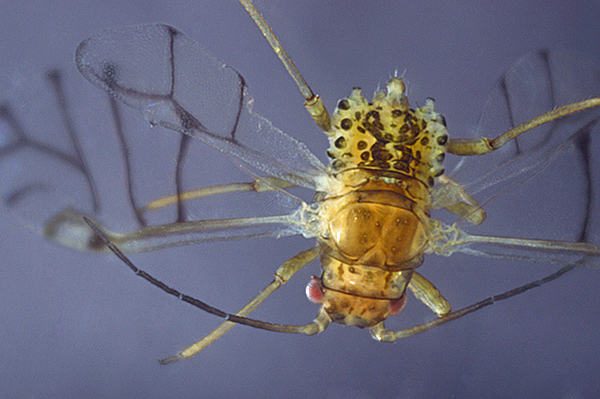 In Australia Therioaphis trifolii was successfully controlled by release of the parasitoid Trioxys complanatus (Hughes et al., 1987).